In the February 8, 2015, issue of the PinotFile, I started the first in a series of articles on “Wine as Part of A Healthy Lifestyle: 2014 in Review.” Each year, it is customary for me to offer a summary of major scientific studies published in the preceding year. As a retired physician, and believer that wine in moderation plays an important role in a healthy lifestyle, I have a dedicated interest in studies that contribute to our current understanding of the roles that alcohol and wine play in our health. I believe it is important to accurately communicate the possible health benefits of drinking wine in moderation. The possible health benefits of alcohol and wine are hotly debated in the lay press. Articles appear with disparaging titles like, “Too Good To Be True,” “Can Wine Be Good for You?,” “No Amount of Alcohol is Safe,” and “Bad News if You Think Wine is Healthy.” The National Institute for Health & Care Excellence (NICE) in the UK even went so far as to proclaim in 2014, “Those who drink a couple of large glasses a wine a day are ‘mild alcoholics.’” The International Agency for Research on Cancer (IAVR) has labeled alcoholic beverages as “carcinogenic to humans,” and placed them in a group alongside ultraviolet light and chronic infection with hepatitis B. Voices of opposition include The International Scientific Forum on Alcohol Research that objected to IAVR’s stance, emphasizing the distinction between excessive alcohol use and moderate drinking. The American Institute for Cancer Research does not even mention alcohol in its latest cancer-prevention campaign, noting that changes in diet, weight and physical activity are the most important preventive lifestyle changes. American pathologist, Emanuel Rubin, M.D., wrote in Alcoholism: Clinical & Experimental Research online in January 2015, “Doctors should tell lifelong abstainers to start having a drink with dinner every night. The overwhelming evidence suggests that physicians should counsel lifelong non drinkers at about 40 to 50 years of age to relax and take a drink a day, preferably with dinner.” Such a bold statement may be sound advice, but it is controversial and most researchers are hesitant to support such a recommendation. The exact point where drinking ceases to be beneficial is unclear but the preponderance of science would suggest that it is above 2 standard glasses of wine a day (a standard glass is 5 ounces of 12% alcohol wine) for men and 1 standard glass of wine a day for women, the current standard definition of moderate drinking and what is considered safe, healthful consumption by the Department of Agriculture and Department of Health & Human Services, and the American Heart Association. Drinking in moderation can be challenging since the ingestion of alcohol leads to alcohol in the bloodstream and the release of the “feel good” neurotransmitter involved in reward-motivation behavior in the brain called dopamine. Alcohol is a rewarding experience that increases the level of dopamine in the reward pathway in the brain, potentially leading to more drinking, binging and even alcohol dependence. 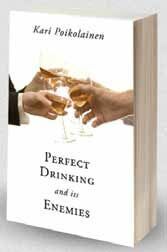 Fortunately, most of us realize the difference between moderate drinking and excessive drinking and do not have a need to obsess about how to enjoy alcohol. Researchers at Iowa State and Cornell University reported in the International Journal of Drug Policy in November 2014 suggested pouring a half of glass of wine no matter the size of the glass to prevent drinking too much. Using this “half glass” rule-of-thumb reduced the volume poured by more than 20% for men and women, and substantially reduced the pour by men with high Body Mass Index (BMI) levels who tend to over pour. The study also found that individuals who drank from wider glasses poured themselves 11.9 percent more wine than those who had smaller glasses. The researchers concluded, “Free pouring wine increases the tendency to over consume because it is not as easily measured as other types of alcohol beverages such as beer or spirits. Glasses make a difference when determining whether you are drinking in moderation. A major study by the Organization for Economic Co-Operation and Development (OECD) found that four in five drinkers would live longer if they cut their alcohol intake by just a glass of wine a week. Between 78 percent and 83 percent of all drinkers studied could reduce their annual risk of death from all causes by having just one less unit (or standard drink) per week. Matthew Doran reported a story at www.abc.net.au/world/today titled “Rise in Wine Alcohol Levels.” The point was that the alcohol content of wine produced around the world has increased over the last 20 years according to data analyzed by Professor Alston from the Robert Mondavi Institute for Wine Economics at the University of California. The trend amounted to about 10% increase for the world as a whole. The result is that people may be drinking more alcohol per glass of wine than they think. Vive, a wristband prototype developed by students at the University of Washington, can detect alcohol levels in the blood and make the wearer check in by vibrating and forcing the wearer to squeeze the device to indicate they are conscious. Check-ins become more frequent as alcohol levels rise. The idea was praised by Microsoft and won “Best Product” at a Microsoft design invent. Drinkaware in the UK launched a free smartphone App that is designed to allow people to monitor their alcohol consumption. It allows users to monitor moderate drinking by offering graphs to show daily, weekly or monthly alcohol consumption related to health risk levels. The App is available from the App Store. For more information on moderate drinking, visit www.drinkinmoderation.org. This site includes information on alcohol and health, standard drink definitions, and the U.S. Dietary Guidelines for Americans. Binge drinking is a confusing and imprecise term since it is defined in several different ways. It is also interchanged with the terms “excessive” and “heavy” drinking. The National Institute on Alcohol Abuse and Alcoholism defines binge drinking as a pattern of drinking that brings blood concentration (BAC) levels to 0.08 g/dL which is also the legal limit for driving. This typically occurs after 4 drinks for women and 5 drinks for men in about 2 hours. The Substance Abuse and Mental Health Services Administration defines binge drinking as drinking 5 or more alcoholic drinks on the same occasion on at least 1 day in the past 30 days. The World Health Organization defines binge drinking as consuming more than 6 units of alcohol (2 175 ml or 6 ounce glasses of wine) on one occasion. According to the Centers for Disease Control and Prevention (CDC), one in six adults in the U.S. binge drink four times a month. 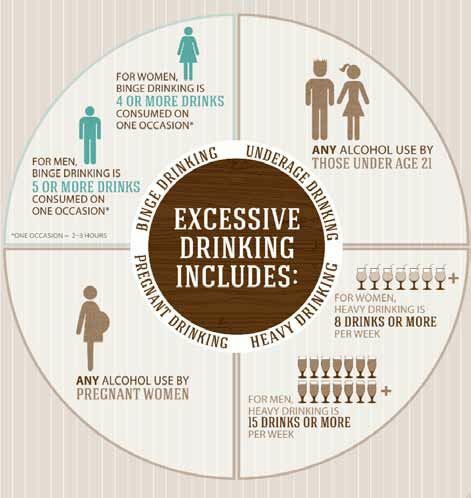 The CDC’s fact sheet on excessive drinking is below. Regardless of how you define binge drinking, it is clearly hazardous to your health. The journal Preventing Chronic Disease reported in June 2014 that excessive alcohol use and binge drinking has led to a death toll just shy of 88,000 people per year in the U.S., 70% of which were men. Binge drinking was responsible for more than half of the deaths. Worldwide figures indicate 16% of the population binge drink. A University of Massachusetts Medical School study funded by NIH and published in PLOS ONE online May 14, 2014, looked at the effects of acute binge drinking in healthy adults on serum endotoxin levels. Previous studies have demonstrated that chronic alcohol use results in increased gut permeability and increased serum endotoxin levels that contribute to many of the biological effects including alcoholic liver disease. This study found that acute alcohol binge result in a rapid increase in serum endotoxin and bacterial DNA levels in the bloodstream. Compared to men, women had higher blood alcohol and circulating endotoxin levels. The biological significance of the in vivo endotoxin elevation was accompanied by increased levels of inflammatory cytokines. The findings indicate that even a single alcohol binge results in increased serum endotoxin levels likely due to increased gut permeability and disturbs innate immune responses that can contribute to the deleterious effects of binge drinking. Alcohol binge is more dangerous than previously thought and has significant health effects even in healthy individuals. A report in the journal Alcohol: Clinical & Experimental Research detailed a study that found among older moderate drinkers, periodic heavy drinking showed a significantly increased total mortality risk compared to regular moderate drinkers. Moderation was defined as no more than one-half a drink per day for women and no more than two drinks per day for men. Both red and white wine have the same amount of carbohydrates and calcium, with red wine having slightly more calories than white wine. Unique to red wine are iron, magnesium, phosphorus, potassium, choline and a much higher concentration of polyphenols, organic compounds found in the skins and seeds of grapes that research has shown to provide several potential health benefits. Resveratrol is the best-known and most studied phenolic compound. One glass of red wine has 200 mg of polyphenols compared to 40 mg for white wine because red wines are macerated on their skins, the source of polyphenols. Champagne, however, has been shown to contain relatively high amounts of phenolic acids. Although moderate consumption of red wine is thought to be healthier as a result, the alcohol in both red and white wines itself confers health benefits on imbibers such as reducing the risk of heart disease and stroke. Recent research in Italy published in PLOS ONE online has suggested that white wine may be as healthy as red wine. This study focused specifically on the polyphenol caftaric acid that is found in both red and white wines and is a powerful antioxidant that may have resveratrol-like effects. The results showed that caftaric acid improved the health of arteries by increasing the availability of the vasodilator nitric oxide in lab mice. The researchers theorized that the antioxidant property of caftaric acid might explain the potential cardiovascular protection resulting from moderate white wine consumption as part of a typical Mediterranean diet. White wine may have been given a bad rap, so don’t avoid a glass of your favorite Chardonnay for fear that it isn’t as “healthy” as a glass of red wine. My advice for white wine aficionados: chill, open, and chill. The well-known and researched Mediterranean diet is based on eating primarily plant-based foods including fruits, vegetables, whole grains, legumes and nuts, and replacing butter with olive oil, and using herbs and spices instead of salt to flavor foods. It favors fish and poultry over red meat, and includes the moderate consumption of red wine. The diet was inspired by the dietary patterns that are traditional in the countries of Greece, Southern Italy and Spain. Its health benefits are many including reduced levels of inflammation, a risk factor for cardiovascular disease, stroke and Alzheimer’s disease, and a decreased risk of diabetes. A study published in Microvascular Research on the long-term effects of exercise and Mediterranean diet intervention on the vascular function of an older (55 and over), healthy population, showed that both the exercise and Mediterranean diet groups had improvements in microvascular outcomes compared with baseline, but the highest improvement was in the group that combined exercise and the Mediterranean diet. A collaborative study by researchers at the University of Miami Miller School of Medicine looked at a group of 1,937 multiethnic patients and determined what type of diet they regularly consumed as well as the mass of their left ventricle using echocardiography. It is known that increased left ventricular mass is a risk factor for cardiovascular disease in many populations. The study found that those adhering to the Mediterranean diet had smaller left ventricular masses than those not following the same diet. After controlling for demographics, behavioral risk factors, diabetes, BMI, height and blood pressure, left ventricular mass was still significantly less in those adhering to a Mediterranean-style diet compared with those that did not. Those with greatest adherence to the Mediterranean diet had the smallest left ventricular masses. Despite the need for further research, this important study indicates that the Mediterranean diet plays a significant role in maintaining good cardiovascular health. A study by Italian researchers published in the Journal of the American Society of Hematology in March 2014, found that adherence to the Mediterranean diet is associated with lower levels of inflammation markers that are linked with increased risk of coronary heart disease. Both platelet and white blood cell counts, markers of inflammation that have been linked to cardiovascular disease, were monitored in 14,586 individuals in Italy. Individuals who had a high adherence to the Mediterranean diet had lower levels of platelet and white blood cell counts compared to those with lower adherence rates. Dietary antioxidants such as those found in olive oil, wine, vegetables and dietary fiber partially accounted for this association. Research published in the journal Public Health Nutrition studied 760 non fatal heart attack patients admitted to hospitals in Italy and compared them to 682 patients admitted to the same hospitals for reasons other than cardiovascular disease as controls. Adherence to the Mediterranean diet was determined by interview for each study participant. The results showed that a higher adherence to the Mediterranean diet was associated with a lower risk of non fatal heart attack in Italian adults and eating vegetables and beans was the most significant factor contributing to this reduced risk. Another Italian study published in the European Journal of Preventive Cardiology looked at the relationship between adherence to the Mediterranean diet and mortality in individuals with diabetes. Overall, those who adhered to a Mediterranean diet had a reduced risk of death. The specific factors in the Mediterranean diet that were thought responsible for this decreased risk of death in patients with diabetes were moderate alcohol consumption, high consumption of cereals and vegetables, and reduced consumption of meat and dairy products. For updates on the science behind the Mediterranean diet and health, visit the blog at www.french-paradox.net. Titled “The French Paradox: The Science Behind the Mediterranean Diet and Your Health,” this blog is coauthored by Becca L. Yeamans-Irwin, a biomedical scientist, and Lewis Purdue, who has an academic background in biology, organic chemistry, environmental science and nuclear engineering. 1 Reduction in the risk of coronary heart disease and heart attack and a lower mortality rate in those who have had a heart attack. The heart healthy benefits of wine may be due at least in part to increases in good cholesterol (HDL). 2 Reduction in blood pressure. 4 Less likely to develop dementia, especially Alzheimer’s. 5 Lower risk of becoming overweight. 6 Lower risk of stroke, particularly in women. 10 May increase performance on cognitive function tests including memory. 11 Regular red wine drinkers have higher levels of testosterone, which increases the libido in both men and women. 12 Resveratrol in red wine can fight fat buildup in the liver, reducing the risk of liver failure. 13 Red wine has been shown to bolster the cancer-fighting powers of antioxidants, aid good bacteria in the digestive system, and help prevent colon cancer. 14 The anti-inflammatory properties of phenols and flavonoids in both red and white wines can bolster collagen and help delay wrinkles. 15 Drinking red wine deters bed bugs from biting. 16 Drinking in moderation may reduce hearing loss in women. The negative health consequences of drinking alcohol in moderation include an Increased risk of certain cancers such as the mouth, esophagus, larynx, pharynx and breast. Moderate alcohol consumption has also been shown to significantly increase the intake of high fat and savory foods. Chicago researchers studied a multiethnic sample of middle-aged, healthy women. Consumption of wine was stable and common with 20% reporting none, 69% light (<1 drink per day), 7% moderate (1 drink per day) and heavy (>1 drink per day). To guard against underreporting, the researchers took the maximum reported wine consumption over 7 years as the predictor. Moderate wine consumers had significantly lower levels of Creactive protein and plasminogen activator inhibitor than women that drank little or no wine. This would indicate that moderate wine consumption may protect against cardiovascular disease via inflammatory and clotting pathways. A study from the University of Gothenburg in Sweden published in late October 2014 in the journal Alcohol suggested that the protective effects of alcohol are present only if you have a certain genetic makeup. Only 15 percent of the population have this genetic makeup (the CETP Taq1B gene). The CETP gene regulates the transport of cholesterol from the peripheral arteries to the liver and this reduces the risk of coronary artery disease. Researchers examined the genomes and compared the drinking habits of two randomly sampled groups that included 618 with coronary artery disease and a control group of 2,921 people. The fortunate people with a CETP gene variation showed a strong link between a lower risk of coronary artery disease and moderate alcohol intake. A previous 1995 study found the same link between moderate alcohol consumption, cardiovascular disease and this specific genotype. One of the most respected researchers in alcohol and cancer, Dr. Arthur Klatsky, published a study in 2014 online in Cancer Causes Control titled, “Moderate alcohol intake and cancer: the role of underreporting.” He looked at a large cohort of more than 125,000 people and controlled for seven covariates. Persons reporting light to moderate drinking had an increased risk of cancer in this cohort with more risk in the group suspected of underreporting. Klatsky concluded that the apparent increased risk of cancer among light to moderate drinkers may be substantially due to underreporting of intake. The risk of breast cancer, for example, was less than one-half as high among moderate drinkers who were unlikely to be under reporters of alcohol intake as among those considered likely to under report their drinking. The Canadian Alcohol and Drug Use Monitoring Survey (CADUMS) reported in 2014 found, “Pretty much everyone under reports, both men and women. The strongest evidence of the relationship between cancer and alcohol ingestion is for head and neck and breast cancer. Prospective epidemiological studies have shown a consistent slight increase in the risk of breast cancer for women who consume alcohol. For women consuming no more than 1 drink per day, the risk is 5-10% over that of non drinkers. Adjusting for underreporting attenuates the increased risk. Wine in moderation may offer more anti cancer benefits than other forms of alcohol. A University of Colorado Cancer Center study found, “The alcohol that had the lowest effect on the body was red wine. There must be something in the red wine that is counteracting the effect of alcohol. We’ve proven that it’s reservatrol.” Mice used in this study were given cancer, but when the researchers gave them grape seed extract, it caused the cancerous tumors to shrink and prevented others from growing. The researchers hope to develop a non toxic therapy for cancer using the substances found in grape seed extract. Another study on grape seed extract and cancer appeared in the medical journal PLOS ONE. Researchers found that adding grape seed extract to chemotherapy is a new effective approach to bowel cancer treatment since it enhances chemotherapy’s cancer-defeating effects, reduces intestinal damage, and decreases chemotherapy’s painful side effects. Grape seed extract led to a 55 percent decrease in chemotherapy-induced inflammation and a 26 percent increase in the ability of the chemotherapy to kill cancer cells with no apparent side effects on healthy intestinal tissue. Grape seed extract is rich in flavonoids, linoleic acid and vitamin E. This is the first study on humans to show that grape seed extract can enhance the potency of one of the major chemotherapy drugs (5-Fluorouracil or 5-FU) in its action against colon cancer cells. Grape seed extract is also showing potential as an anti-inflammatory treatment of bowel diseases. Other studies on whether grape seed extract can prevent cancer have been inconclusive. Levels of beneficial flavonoids and linoleic acid in wine are not high enough to provide cancer therapy. A major study on breast cancer and alcohol intake was published in American Journal of Epidemiology. The association between alcohol consumptions and breast cancer in 54,562 women aged 55-74 years was studied with a median follow-up of 8.9 years. Although this study concluded that women drinking as little as less than one-half of a drink per week had an increase in breast cancer risk, critical reviewers of this study felt this was unlikely to be truly related to alcohol intake and could have been attributable to residual confounding from underreporting, diet, beverage type and other factors. It was clear that binge drinking of 4-5 drinks on a weekday increased the risk of breast cancer by 55%, compared with consumption of one drink. The study did confirm previous research that has found the types of breast cancer tumor most often associated with alcohol consumption are hormone-receptor-positive (ER+/PR+). Dietary and genetic factors definitely play a role in breast cancer risk. Folate in the diet may interact with genes that are associated with breast cancer. The Mediterranean diet is typically high in folate. A study reported in Genes & Nutrition, looked at 1,109 women with breast cancer from Cyprus who were genotyped. The results indicated that women from Cyprus with certain genotypes that put them at risk for breast cancer had a reduced risk if they adhered to the Mediterranean diet. A possible explanation is that folate in their diet played a role in reducing the risk. A survey presented at the 36th Annual San Antonio Breast Cancer Symposium involved 1,692 women responders. Only 2% had been diagnosed with breast cancer. 88% reported being “uninterested” in learning about how to reduce alcohol consumption. Yet, a majority of the respondents (78%) were interested in learning how to reduce breast cancer risk, especially related to exercise, weight and diet. The International Scientific Forum on Alcohol Research current stand on breast cancer is as follows. “While there is an indisputable association between alcohol consumption and the risk of breast cancer, the mechanisms behind the association require further elucidation. The risk of breast cancer should not, however, be considered in isolation from the risk of other factors for mortality, such as cardiovascular disease, whereby cardiovascular disease is the primary cause of mortality in of the westernized world. Light to moderate consumption of alcohol is associated with a significantly reduced risk of mortality from cardiovascular disease and all causes, both for men and women, irrespective of age and ethnicity. Thus, it may be advisable for women to enumerate and evaluate their risk factors for cardiovascular disease and for breast cancer before deciding to abstain from alcohol completely.” I would add an additional consideration for women is the dramatic drop in breast cancer deaths in the past two decades, the result of better awareness, more women getting mammograms and better treatment. Previous epidemiological studies have not shown a consistent association between alcohol intake and endometrial (uterine) cancer risk. An analysis from the Nurses Health Study published in the British Journal of Cancer provides prospective evidence for an inverse association between light alcohol intake (about half a drink per day) in the long term and endometrial cancer risk (20% lower risk), but above that level no significant association was found. This study adds to the accumulating scientific data that moderate drinking does not increase the risk of uterine cancer, and probably is associated with a reduction in risk. A meta-analysis published in the journal Annals of Oncology studied the association between alcohol consumption and liver cancer risk. The analysis found that liver cancer is related to heavier alcohol intake, but not light-to-moderate drinking (less than 3 standard drinks per day). The study did not differentiate among the various types of alcoholic beverages. This review confirms previous findings that liver cirrhosis, which usually precedes the development of liver cancer, is related to heavy alcohol consumption. Researchers in Ontario, Canada, reported in Cancer Cell International that in-vitro studies of human lung cancer cells found that both red and white wines stopped the spread and survival of lung cancer, with the reds being the most effective. The authors of the study hypothesized that the higher phenolic content of red wine may be responsible. A follow-up study will look at the effect of doses of wine equivalent to moderate consumption in humans, and and its effect on tumor growth in mice. Finally, an interesting study published in the Journal of Agriculture and Food Chemistry reported that marinating meat in pilsner or black beers before barbecuing can lower potentially harmful amounts of carcinogens that have been linked to colorectal cancer. Black beer was the most effective. If you are concerned about wine consumption and your risk of certain cancers, personal health behaviors should include monitoring your alcohol intake so that you limit consumption to moderation (1.5-2 drinks per day for men and 1 drink per day for women). Taking a day off each week may allow the liver to recover from the effects of alcohol. Consult your physician about your genetic risk for certain cancers. To be continued in upcoming issues of the PinotFile.